Regular classes tonight in Carlyle! Regular Class at Whitebear dojo tonight… Tournament this weekend! Regular Thursday class again at the Whitebear dojo tonight. There WILL be class on Tuesday evening at the Carlyle dojo even though the students in SE Cornerstone School Division don’t have school that day! Regular class tonight at the Carlyle dojo! The following is a list of upcoming tournaments that are regularly attended by our members. We encourage everyone to participate in tournaments at every rank. That is how you extend your “Karate family”. You will develop your “tournament family”; those people that you compete with at tournaments throughout your progression through the ranks. Tournaments are a great opportunity to challenge yourself to step out of the comfort zone of our dojo. It is also a great opportunity to receive advice and feedback from other Sensei who may see something we miss simply because we see you every week. If you participated in the club fund-raising events, we can also help subsidize your tournament participation by covering registration and other costs as our funds allow. There will be a sign-up sheet at class tonight for those interested in participating in the South Calgary Annual Tournament at the beginning of March. This will be a “group” event and the club will attempt to cover as much of the costs as we can. Depending on the number of people interested, we will look at various methods of transportation for our group. The tournament is coming up fast, so please be sure to sign up. Information for all these events can be found online at Shintani.ca and will be posted here on our website as the tournaments draw near. Tickets must be turned in tomorrow! All snowmobile rally ticket books MUST be returned tomorrow. Bring back ALL tickets sold or unsold. 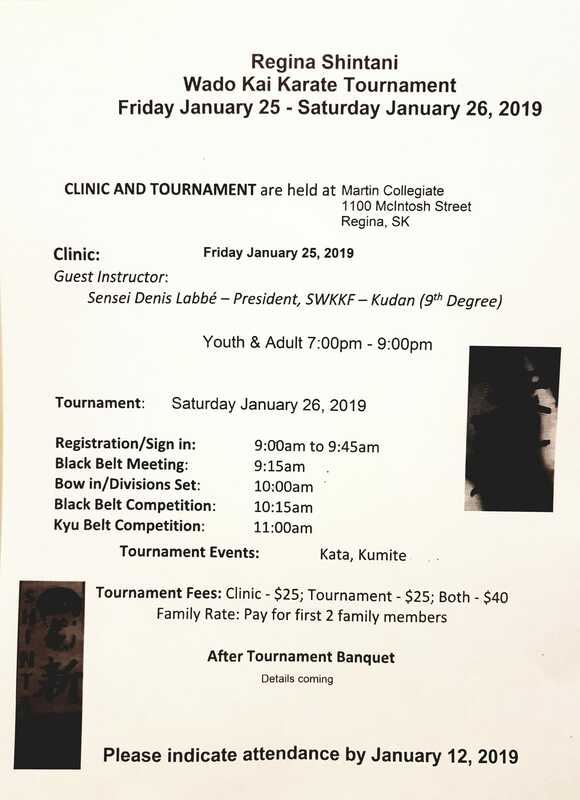 The 1st Annual Regina Tournament and Clinic is this weekend. The information is below. If you are interested in attending the Calgary Tournament at the beginning of March, please add your name to the sheet at class tomorrow night.